Cancer is one of the most difficult foes medical science has ever faced, but a controversial new idea might just show a way to victory. A group of scientists have evidence that cancer might be an evolutionary throwback to our most distant animal ancestor. Astrobiologists Charles Lineweaver of the Australian National University and Paul Davies of Arizona State have proposed that cancerous cells are a so-called "living fossil", the last remnant of a crucial evolutionary juncture some 600 million years ago. 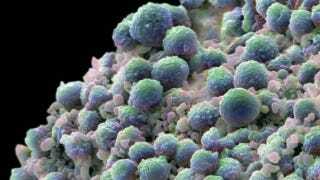 It's been proposed before that cancer dates back to the beginning of multi-cellular animals, an evolutionary innovation that required cells to stop replicating whenever they wanted and start coordinating with the rest of the organism. Cancer is what happens when these very ancient controls on cell replication break down, causing runaway cellular replication. But here's where Lineweaver and Davies take the idea a step further - they suggest cancer actually is our earliest animal ancestor. They suggest these organisms were the first to figure out some measure of control over cell replication, but they lacked more precise control over cell growth. This hypothesis, they argue, fits known tumor behavior better than the view that all cancer cells act independently. They point to angiogenesis, in which cancer cells built blood vessel networks to bring nutrients into the tumor, which suggests cooperation amongst the cells. Indeed, the very act of metastasizing, in which cancerous cells move to other tissue areas, is hard to explain if all the cells are acting independently. Now, not all of Lineweaver and Davies's peers accept their new hypothesis. While their framework and predictions have received some praise, the idea that cancer is actually a living fossil for the earliest animal life has been met with controversy. It may be that their hypothesis ends up being more of a useful metaphor for understanding how cancer cells work together than as an actual literal explanation. Still, assuming this idea is correct, how does it help any of us? Well, Lineweaver and Davies suggest that, if cancer really is our evolutionary ancestor, then its genetic toolkit has been locked in place for 600 million years, and its repertoire of survival methods is infinitely more limited than that of, say, bacteria, which has the capacity to evolve resistance to practically any therapy. By comparison, cancer may have a relatively limited set of ways to resist therapies, and its methods shouldn't be anything that its evolutionary descendants - such as ourselves - are capable of. Lineweaver is hopeful genetic profiling will offer experimental support for his and Weaver's hypothesisObviously, even a limited survival toolkit has served cancer well in the decades medical science has spent trying to stop it, but in the long run, it should mean that cancer will run out of places to hide. Physical Biology via New Scientist. Image via.